Trips WITHOUT Our 4 Kids! Trips WITH Our 4 Kids! It sounds impossible. 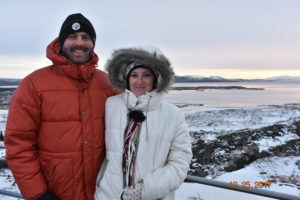 How can you truly accomplish any sort of sight-seeing in 3 days… in Iceland… in the winter. That’s a fair question, but of course we love a challenge. 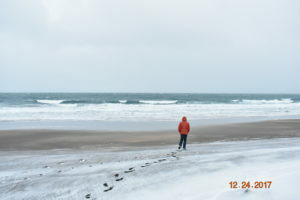 Most of our trips are whirl-wind, pack as much as possible into the least amount of time- types of trips. Because that’s the best we can do at this point in our lives. So if you’re short on time, but still want to see and experience as much as possible, keep reading! The idyllic beauty of Iceland is completely unique and unlike any country we’ve seen. Enormous cliff-side mountains made of volcanic rock, steep valleys void of large vegetation, and bodies of sparkling blue water will draw you in. For a large part of our drive, we sat there silently marveling at the “other-world” like scenes in front of us, laughing as we reminded ourselves that we were still on planet Earth. The beauty of Iceland is, in a word, stunning. Utterly and absolutely stunning. 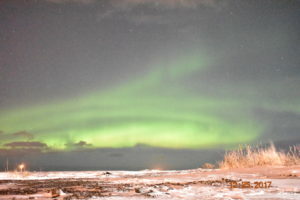 Not to mention the kind people, unique experiences, oh and the Northern Lights- if you’re lucky enough to experience them! Iceland imports the majority of its necessities. For this reason, food and gas are very pricey. For example, at the cafeteria located in the visitor center of Geysir, a ham and cheese sandwich was roughly $20, and a cup of tomato soup was $14. This was a touristy area, so naturally prices would be higher, however other restaurants had similar high prices. Additionally, we were visiting around Christmastime, and a LOT of the restaurants (sparse to begin with outside of major cities) were closed for weeks or even the entire winter season. We knew this in advance, so we rented a cabin with a kitchen and planned to cook our own meals instead of staying at hotels. 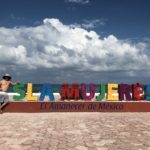 This is a must if you are traveling on a budget. We went grocery shopping in Reykjavik on our first day, bought enough supplies for 2 dinners, 2 breakfasts, plus drinks and snacks, and we spent a total of $50. This should be a given, but Iceland has some pretty intense weather. Being Floridians, our winter wardrobes are limited, but man did we learn how to layer! Daytime high temperatures while we were visiting were lowest at 5-10 degrees, barely hit 30 degrees, and hovered around 25 degrees the majority of the time. Granted, that isn’t too terribly cold in the grand scheme of things, but throw in the 40 mph winds and snow and you have yourself one Frozen Floridian! (sounds like a yummy boat drink… hmm…) Prepare to layer with multiple warm shirts and long johns or fleece lined leggings – my new favorite cold weather accessory. Driving in an Icelandic snowstorm was a once in a lifetime opportunity for me. Not only was it my first time driving in snow, EVER, but it was also my first time trying to drive in a white-out. For my fellow Floridians, a white-out is when the snow is falling at such a rate that you cannot see past it; your entire field of vision is just white. It was terrifying! I got out of the car (yes, I voluntarily entered a blizzard! 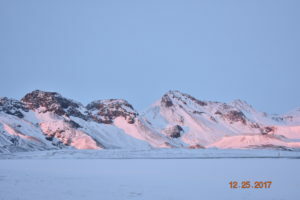 ), guided Brandon in the car as he turned around, and walked back down the mountainside with him until he let me know he could see. I should probably mention that we were attempting to cross a glacier during a blizzard, but that’s such a minor detail. My next piece of advice – don’t try to cross a glacier during a blizzard. See previous paragraph. 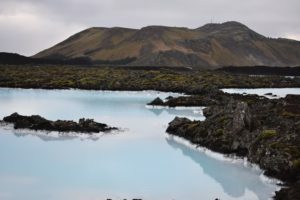 The very first thing you should do after landing is immediately go to the Blue Lagoon, especially if you just had an overnight flight in an economy seat. 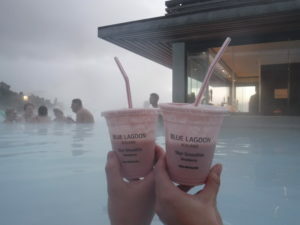 The Blue Lagoon is geothermal spa located in a lava field, with silica-laden, 104-degree water and it feels amazing. Absolutely rejuvenating in the very best way. Not to mention they have swim up bars for drinks and smoothies, as well as a swim up facial! Be sure to book in advance, it does sell out. One thing I did not know beforehand- they charge a rental fee for towels so if possible bring your own. The facility is very nice- they have showers with toiletries for after you swim in the springs, as well as hair dryers in the changing rooms. I was very excited about this. After visiting the Blue Lagoon, we drove our little Hyundai up to Grundarfjörður, where we rented a perfect little cabin for a few days. (https://www.airbnb.com/rooms/1821249 – This incredible location books up very quickly!) This peninsular area of Iceland is known for the Kirkjufell mountain, Snæfellsjökull National Park (which includes a volcano glacier! 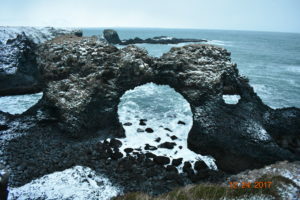 ), Vatnshellir Cave, and the Gatklettur Arch Rock. 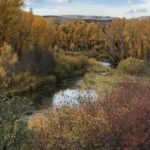 We spent a day driving around the loop seeing these magnificent places. Totally doable and incredibly worth it. 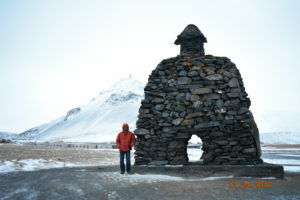 Other must-see attractions include everything that is part of the “Golden Circle.” I could write an entire post about the amazing things to see on this 300 km loop. 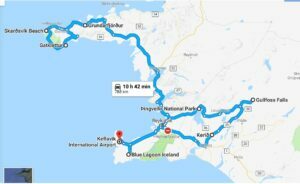 Almost every tour provider of Iceland has a Golden Circle tour, but because we rented our own car we were able to make this beautiful drive at our own pace. 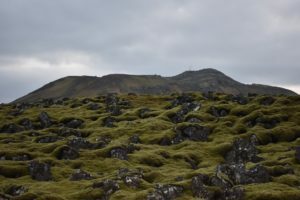 In one day, we were able to experience Þingvellir National Park, the Geysir Geothermal Area, Gullfoss Waterfall, and the Kerid Crater. 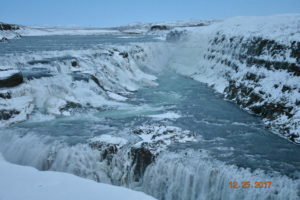 Þingvellir National Park on its own could easily take multiple days to fully explore and enjoy. 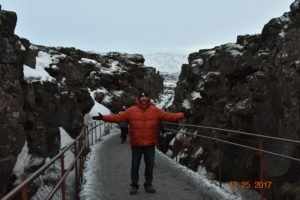 Though we were not able to devote that amount of time, we did at least get to see the rift valley between the North American and Eurasian Tectonic Plates. If you happen to visit in the warmer months, there are tours where you can actually scuba dive between the two plates! The other 3 stops we made were short visits to admire the natural beauty, snap a few photos, and move on quickly as daylight was limited and also it was ridiculously cold and windy. 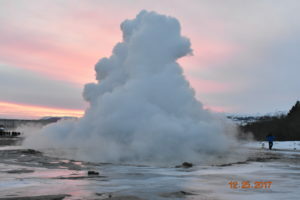 It was totally worth it though- we were able to see land forms and geothermal geysers that are completely unique and unlike anything we’ve seen before. I saved my absolute favorite experience in Iceland for last. 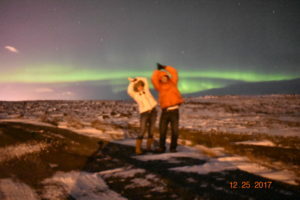 When we first decided to go to Iceland, it was for the sole purpose of seeing the Northern Lights. We told ourselves that the weather could possibly prevent us from seeing the lights, and we agreed if that happened, we would accept it- but we were kidding ourselves. Each night we used a very handy website that showed us the cloud cover and cloud forecast. We found patches of the country were the clouds were sparse and drove there, hoping to see the lights. We saw them faintly, barely visible between the shifting clouds. Even though we knew all along seeing the Northern Lights would be a toss-up, that first night we finally admitted we were going to be pretty devastated if the weather prevented us from seeing them at all. As we were driving to our hotel in Keflavik on Christmas night, rather sad to already be leaving and especially sad to be leaving without seeing the lights, it happened. We saw a faint green lining to one of the clouds low on the horizon. The entire sky above the cloud was perfectly clear. There were SO many stars. We pulled over at the first possible spot and waited. Brandon told me to begin taking pictures so I could be ready when the lights became more visible, and as we sat there shivering, the clouds dissipated and we had our very first Northern Lights show! 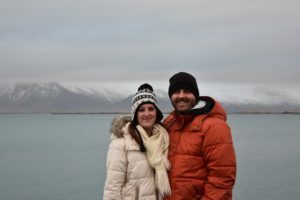 We were shocked to see them, and so incredibly grateful that our trip to Iceland finally felt complete. If you are considering Iceland as a travel destination, I highly encourage you to go experience everything the country has to offer. 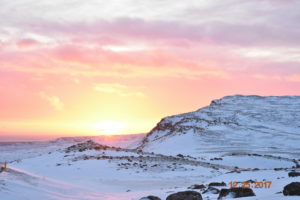 The Icelandic people are so very kind, the scenery is captivating and awe-inspiring, the activities available are unique and exciting – overall this is just such an incredible country. I can’t wait for our next trip back!